"You must turn your cooking to art and each time your meal must be an artwork"
"National Dishes From Around The World" an e-book with my recipe in it! Hope you are all in good health, happy and sound! As I am one of the country chefs, I represent Uzbekistan with my "Tuy Palovi" - Wedding pilaf and it is on page 26. I love this ebook! It is colorful, recipes look so mouthwatering and the design is just amazing! Download the book and let me know what do you think about it! 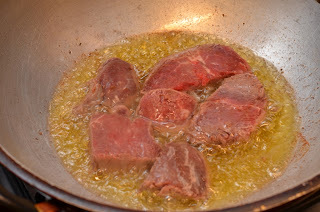 Mix minced meat, rice, melted butter, salt, pepper and cumin seeds and small egg all together. Shape up small oval shaped chunks with your hands. (If meat tends to stick on your hand, just wet your palms with cold water). Set aside. Heat up oil and fry onion over medium heat, until golden in color. Add in capsicum and carrots, continue to fry until carrots are half done. Add in tomato, fry until oil will starts to separate out. Pour in 1.2 liters of water and bring to boil over high heat. When it starts to boil, lower the heat and scoop out a little foam. Put in meat balls and cook until rice is done (Scoop out any foam that will float on the surface). At the end, add in salt and boiled quail eggs and cook for about 5 min. Serve as hot with a teaspoon of sour cream on top. Hi everyone! I am so happy that I am back here:) How are you? Hope everything is great on your side! Todays post is again about "Sumalak". Spring is the right season for this dish and so, I usually got many comments and emails about "Sumalak" during this season. I am so delighted when my readers send me their photos with the "sumalak" they cook and I really appreciate that they give me a lot of kind feedbacks! I want to say thank you to all my readers! Thank you for your comments, appreciation and your photos! First of all I want to show you the photos of my wonderful reader Nadira. Her sumalak turned out great! It looks great and she said it tastes great too! "Thank you for your wonderful recipe! I made Sumalak at home and My Sumalak turned out so yummy and beautifully! My family enjoyed! I really love your blog! PS: I want to show the photo of My Sumalak to you. Where can I post the photos! Thank you so much! May Almighty Allah bless you and your family! :-) "
Thank you Nadira for your appreciation and photos! I noticed that Nadira added some walnuts to her "Sumalak" instead of stones. I can tell you that the walnuts in "Sumalak" taste really nice! 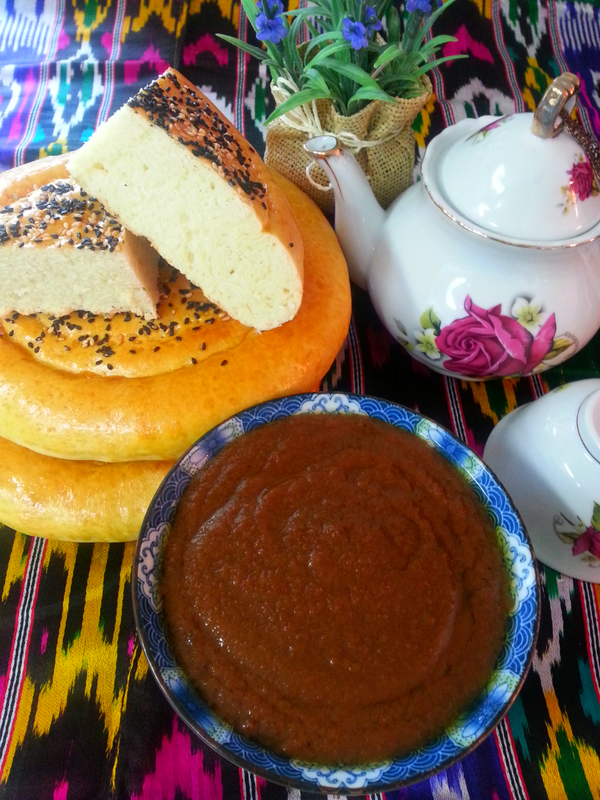 I also noticed those home baked breads in this photo, I bet Nadira baked them along with "Sumalak", they look yummy too! Nadira you did a great job!!! This year I didn't planned to cook "Sumalak", I thought I would buy it from local markets. But after trying about 20 different "Sumalak"s , I decided to cook it myself, because I couldn't find the "right" taste that I like. 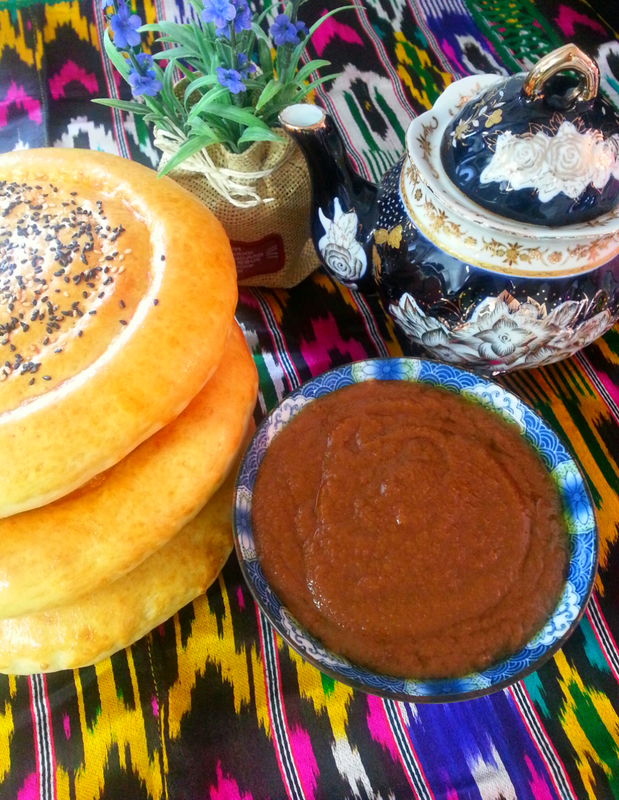 This was my first time cooking "Sumalak" in Uzbekistan! And one more tip: Cook your "Sumalak" with lots of LOVE, that's how it turns out great and yummy!!! That's all! : ) Our "Sumalak" turned out so yummy and thick! Better than any chocolate! Happy New Year my dears!!! Time passes in speed of light! 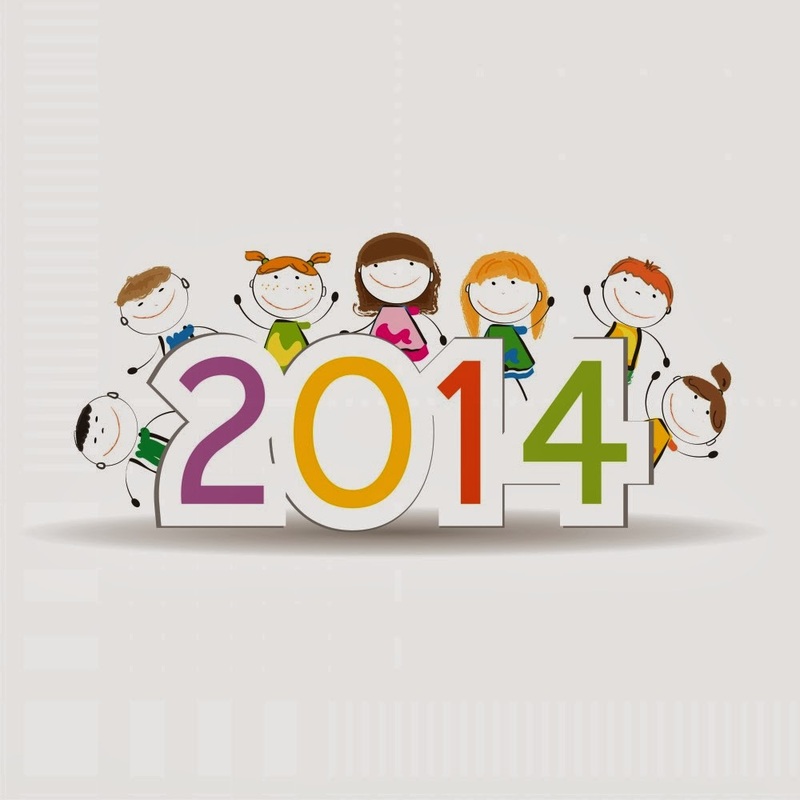 It is already a New Year-2014!!! New Year is a magical holiday! It is amazing how people in all over the world are united celebrating it! I believe that in this kind of magical days all our prayers are heard, because there is so much positive energy that fills the earth with LOVE! And when LOVE is there, everything works only for good! My dearest ones! I hope that this year-Horse will bring us only JOY, HAPPINESS, LOVE!!! I am wishing you a New Year that fulfills your dreams! 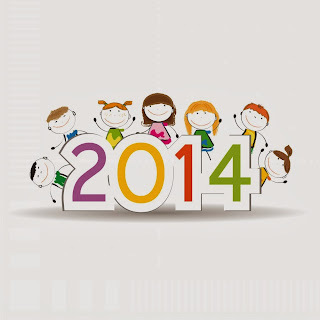 May this year bring victory and success to all of us!!! 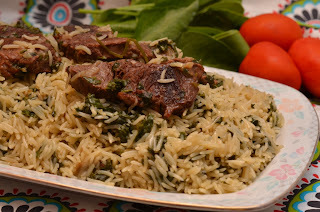 So, I am here with another recipe which is being requested for many times:) This kind of pilaf is very popular in Bukhara region and it is mostly made in spring times, when greens are fresh. It helps to strengthen immune system and gives all needed vitamins and nutrition that human body needs in spring time. Greens are used instead of carrots (mostly spinach, coriander and dill are used, but you can also use your favourite greens). Finely heat the oil and brown meat over high heat. 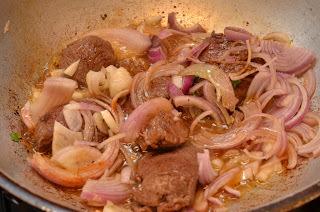 Add in onions and fry until onions are soft. Lower the heat and evenly layer all of the greens on top of the fried meat and onions. 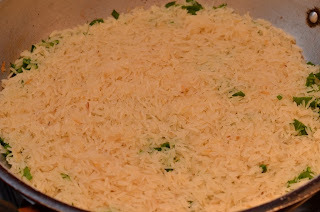 Finely wash the rice and immediately layer over greens, mix carefully and add in 1 cup of water. Set the heat on high and wait until it will come to boil. 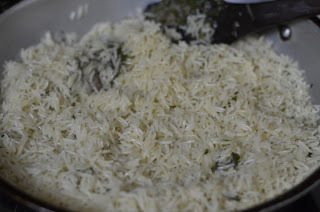 You will see how greens will start to give their juice and cover up the rice, which is the reason why we don’t put much water. Add in salt and spices. Observe your pilaf; if juice of the greens and poured water will not be enough to cover the rice for 2 cm, then you can add in a little more water. 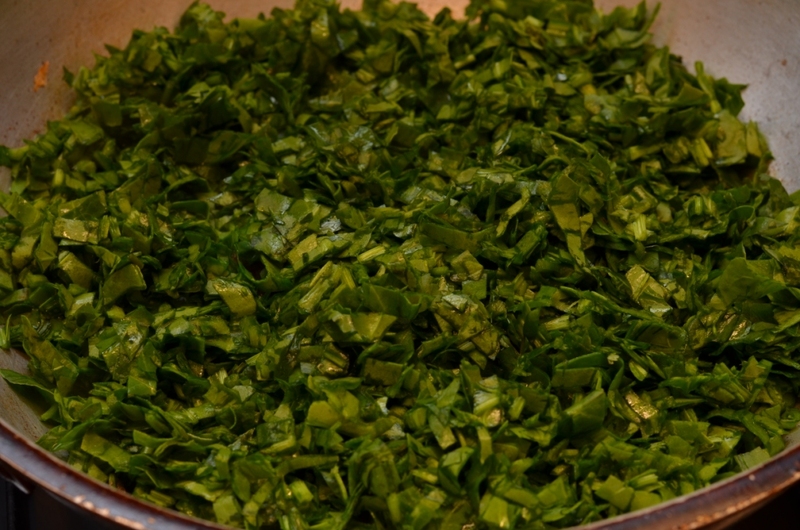 Or if greens are too juicy and will give too much juice, you can reduce the water carefully with the spoon. This is the tricky stage, as you can't predict the juiciness of the greens. Let it boil and wait until all the liquid is evaporated. When all water is evaporated, mix only the top of pilaf, set the heat on low, cover the lid and cook for about 20 min. Open up the lid after 20 min and again mix only the top of the pilaf and cook for 10-15 min more or until rice is properly cooked. When pilaf is ready, finely and carefully mix all of the pilaf. You will see how the colour will turn out to be slightly greenish. Mmmm, this pilaf tastes just heavenly!!! Serve it with fresh salad made of just tomatoes and onion on side. Enjoy! With lots of love!!! Hi everyone! Long time no posting:) as always I am so sorry guys for my "holiday out":) Time is just amazing thing, you won't look up and bumps! - three or four month are passed just like a second... But thankfully it is passed with a lot of fun and love! Hope you are also having a good time and trying to see good in everything..
Usually I make compotes out of different fruits like apples, plums, apricots, pears, cherry's, berry's and so on. 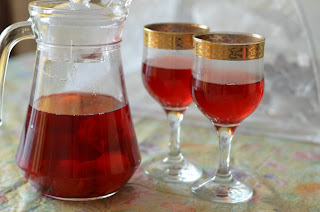 So today's post is about apple and plump compote:) Enjoy and have fun making it! Boil 1.5 liters of water. 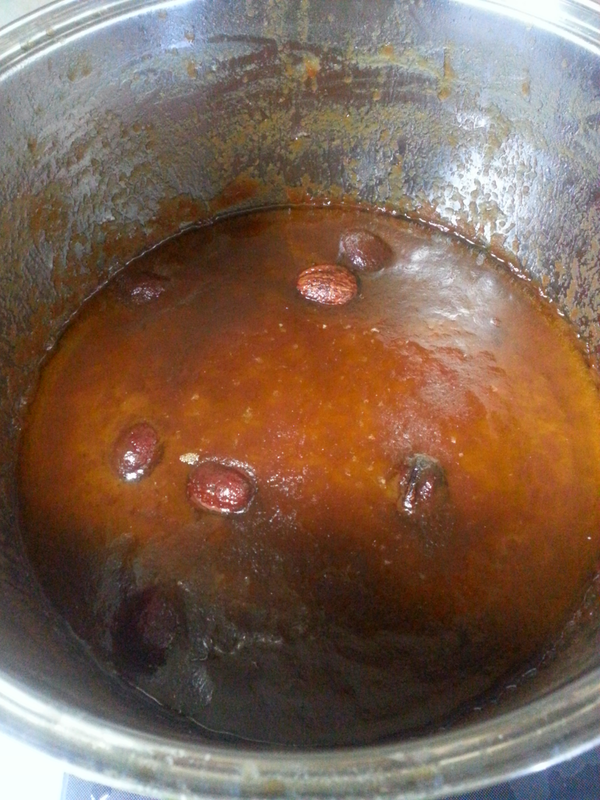 When water starts boiling, put in apples and plums, set the heat on smaller then medium and simmer for 20 min. At the end add in sugar for your taste. Take from heat and let it cool down completely. Put in fridge and serve chilled.